The Erskine Church and cemetery are located at the north east corner of Finch Avenue and Fairport Road and also a piece of land used for cemetery purposes across the road on Fairport Road on the north west corner. 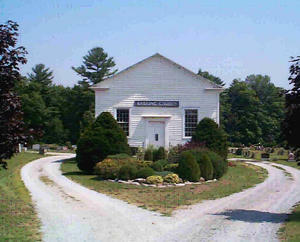 The Erskine Church appears much like it did when it was built in 1853-54. It has been moved back on the property one hundred feet and mounted on a stone foundation. The cemetery was established in 1854 also. The cemetery is now maintained by Dunbarton-Fairport United Church. The cemetery is located on Liverpool Road south in the Fairport area of Frenchman’s Bay. The Fairport Church was in a summer resort are and the residents started holding summer services in July 1920 until 1947, then year round weekly services were held under the auspices of Dunbarton United Church. The Erskine Memorial Service is held at the cemetery every year on the second Sunday of June at 3:00 p.m. Please click on these links to view the Cemetery Bylaws and Price List pages.